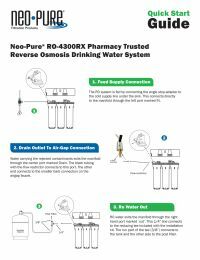 The Neo-Pure NP-4300Rx Pharmacy Trusted Residential Reverse Osmosis System is the key component in the process of providing USP grade water for the reconstitution of antibiotics behind the counter in pharmacies across the country. Medication safety is paramount to patients’ lives, and no one takes that more seriously than your local pharmacist. Pharmacy trusted means family trusted. 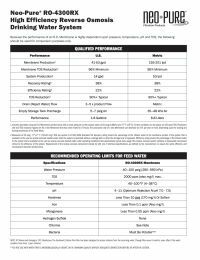 The RO-4300Rx is specifically designed for needs found in residential water supplies. Made in the USA. All Neo-Pure 4300-Rx components are made in the USA to ensure material safety, and reduction claims. Compact Design. The Neo-Pure 4300-Rx Residential RO System has a compact design that fits conveniently under your sink. Change Capacity. The carbon filters for this unit need to changed out every 6-12 months. The membrane needs to changed out every 24 months. Thin Film Composite Membrane (TFM). The new technology in Neo-Pure membranes uses a layered film system to separate clean water molecules from inorganic waste contaminants.The TFM membrane rinses the dirty wash down the drain. Fresh Water Systems offers Auto Refresh. The filter cartridges needed for this system need to be replaced annually. We’ve got you covered. Place your order online or on the phone with any of our Certified Water Specialist. Answer a couple questions and schedule replacement cartridges to be shipped automatically! 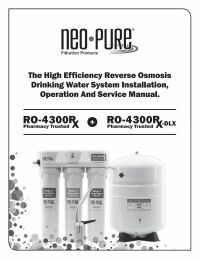 The Neo-Pure RO-4300Rx features a dual probe comparative monitor, which accurately assess the membrane performance and alerts you when the membrane needs to be replaced. This percentage rejection water quality monitor provides your family peace of mind at the touch of a button.